Industries with a focus on custom-built products are facing constantly changing requirements for product and process specifications with regard to the development and production of each single product. These changing requirements influence the development, integration and application of technologies. Due to the growing level of technological complexity of custom-built products in particular, the importance of a structured method to help evaluate, store and communicate information on technologies for their development, application and integration is becoming more and more important for industries with a focus on custom-built products. In this context, the growing importance of the Internet as an information source in technology monitoring, and the increasing use of social software on the Internet, provide new approaches for the collaborative evaluation, storage and communication of information. However, no industry-specific solutions are available in technology monitoring that respond to the specific requirements of industries with a focus on custom-built products or that take into consideration the new collaborative approaches provided by the Internet and the application of social software. • What are the key factors that distinguish technology monitoring for industries with a focus on custom-built products from other industries with a focus on mass production? • What are the specific requirements for technology monitoring in industries with a focus on custom-built products and what methods of technology monitoring are currently used? • How do existing instruments of technology monitoring comply with the specific requirements of these industries and how do they have to be complemented, further developed, or integrated? 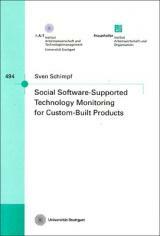 • How can the mechanisms of social software support technology monitoring for industries with a focus on custom-built products? To answer these questions, this paper is split into four major steps: The first step is the scientific classification of the topic in which relevant areas are described and further defined. The second step involves analysing the state-of-the-art and identifying requirements for technology monitoring for custom-built products in literature and through qualitative analysis. The third step focuses on developing the integrated method which is then tested and validated in three industrial companies in the fourth step.In the context of this paper, the construction industry is considered a sample industry with a focus on custom-built products. Therefore the qualitative analysis of the requirements for technology monitoring for custom-built products, and the development activity, concentrate on this industry. To highlight how the method developed can be transferred to other industries, a company from the field of industrial automation is involved in testing and validating the method.